"I venture to suggest the propriety of referring it to a new genus of saurians....and I propose to distinguish it by the name of Hylaeosaurus." (meaning 'Wealden Lizard'). Mantell estimated the size of the creature to be in excess of 25 feet, half the size of Iguanodon and Megalosaurus. 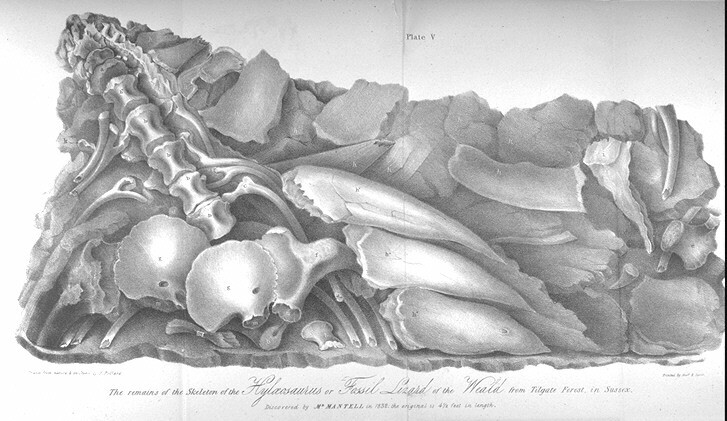 In 1840 Mantell published a different illustration of the same Hylaeosaurus slab, completely redrawn and quite different to his original. Hylaeosaurus was one of the 'founder members' of Owen's 'Dinosauria'.